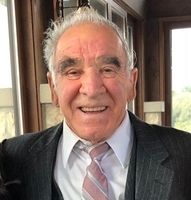 Provide comfort for the family of Franco "Frank" Rigutto with a meaningful gesture of sympathy. Entered into rest suddenly at the Brockville General Hospital, Charles Street Site on Tuesday, February 12, 2019. Franco Romano Rigutto, at the age of 86 years. Beloved husband of Franca, for over 62 years, and dear father of Sara Lee (Peter), Rita Hanes (Steve) and Lora Rigutto Vigliatore (Guy). Fondly remembered by his grandchildren Jessica Lee, Taylor Hanes, Michael Lee, Ryan Hanes (Megan), Francesco and Alexa Vigliatore; and by his great grandchildren Sydney, Jamielynn, Charlie and Landon Hanes. Frank was predeceased by his parents Augusto and Isolina Rigutto. Family and friends are invited to pay their respects at Irvine Memorial Chapel at Roselawn, 2451 County Road 15, Maitland on Tuesday, February 19, 2019 from 11:00 am until 1:30 pm. A Liturgy of the Christian Funeral will be held in the chapel at 1:30 pm. As expressions of sympathy, donations to Diabetes Canada, the Heart and Stroke Foundation, or the University of Ottawa Heart Institute Foundation will be gratefully acknowledged. Send condolences or make a donation online at www.irvinememorial.com. We encourage you to share your most beloved memories of Franco "Frank" here, so that the family and other loved ones can always see it. You can upload cherished photographs, or share your favorite stories, and can even comment on those shared by others. MItel PDM Department sent flowers to the family of Franco "Frank" Romano Rigutto. My condolences to you and your family, Rita.